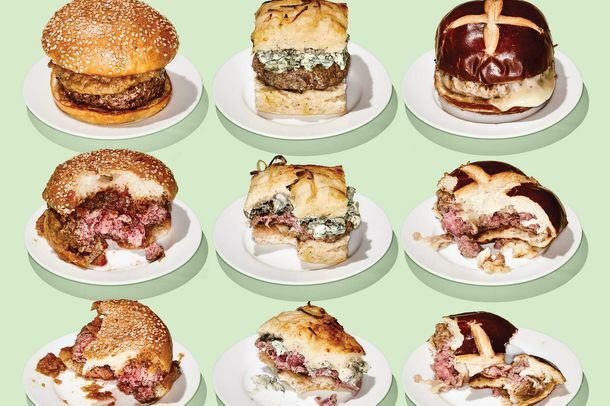 5 Excellent New Burgers for Resolution BackslidersWhen you tire of jackfruit tacos and cauliflower steaks and crave a juicy burger, here’s where to find five of the best new arrivals. The Poor Planner’s Last-Minute Guide to Mother’s Day BrunchIt’s not too late to make a plan to go to Uncle Boon’s, Bar Primi, or Vic’s. Where to Go Eat, Now That It’s Finally Nice OutQuit binge-watching Netflix. The Surprising Restaurant Economics of Valentine’s DayWhy busy restaurants might actually make less money than usual on February 14. 10 Charming Cassoulets to Keep You Warm This Week (and Beyond)How about some applewood-smoked jaggerwurst? 14 Restaurants Where It’s Better to Sit at the BarDel Posto, Peasant, Buvette, and more. Buvette’s Jody Williams and I Sodi’s Rita Sodi to Join Forces at ViaTwo cooks, one kitchen. Where Jody Williams Eats Around the World; Swig n’ Swine at Union PoolToday’s Leftovers. Situational Dining: Where to Eat and Drink Outdoors in New York This SummerIncluding Hawker Bar, Distilled, and Montmartre. Slideshow: From Rabbit to Cauliflower, Pie Goes SavoryIt’s not just for dessert anymore. Situational Dining: Bar and Restaurant Recs for Every Conceivable ThanksgivingWe’ve got you covered, whatever the mishap or planning lapse. Mission Chinese and Buvette Are Opening (Separately) in ParisLa ville-lumière gets two more beacons. Jody Williams Is Writing a Buvette-ish CookbookCool oeufs! Mastering the Art of Julia Child Restaurant WeekNext week, NYC restaurants are rolling out some of Child’s most famous recipes. Sietsema Compares 900 Degrees to Domino’s; Sifton Likes Desmond’sPlus: Gael Greene disses Duo’s carpaccio, and more, in our morning news roundup. Buvette Now Serving Breakfast, Complete With Espresso-Machine-Steamed Eggs“After promising for months and months, we finally got up early,” says chef-owner Jody Williams. Sifton Enjoys Graffit; Cheshes Split on Mile End, Octavia’s PorchPlus: Sietsema introduces Yi Lan, Goldfield impressed by Porsena, and more, in our weekly roundup of restaurant reviews. Platt on Ciano, Millesime; the Robs on the City’s Latest RestaurantPlus: It doesn’t matter if you can’t tell your persimmons apart, and a chat with Nate Smith of Prospect Heights’ Dean Street, all in this week’s magazine. Jody Williams Goes FrenchHer French-inspired gastroteque, Buvette, is a place where people meet for casual food and drink any time of day.